Book now for Dinner & Show: Thriller Live with dinner at Bella Italia - Shaftesbury Avenue! Relax with a stress-free night in the West End! Start your night off at Bella Italia - Shaftesbury Avenue for a wonderful Italian meal. Our automatic table reservations mean no worries about timing, and Thriller Live is less than 5 minutes away at the Lyric Theatre, so you can comfortably stroll to the theatre. Make sure you have enough energy to enjoy the hits of Michael Jackson spanning his whole career. Starting with Jackson 5 classics like ABC and I Want You Back and of course including solo hits like Billie Jean, Black or White, Man in the Mirror and Smooth Criminal. Your night will end singing and dancing your way through Michael Jackson’s greatest hits. Don’t miss your chance to see this tribute to the King of Pop. 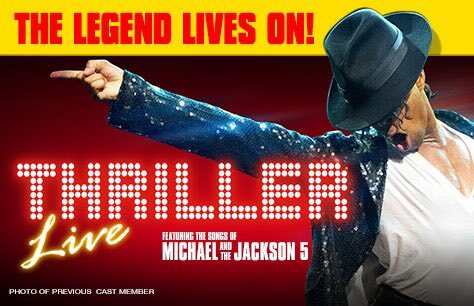 Get your Thriller Live tickets and Meal Deal package and you’ll be moonwalking through the West End. Booking until 4 April 2019. The restaurant did not have a reservation for us even when I called the Lyric Theatre a few days before to confirm. After that they delayed us with payment and service change and we missed the beginning of the Show. Not very impressed at all. In the show there where people talking in front and blocking our view constantly and the stewards did nothing about this. For the amount I paid for quality seats it was not good enough.